Location Based Services have been a passion of mine for quite awhile, however until recently accuracy has been a challenge. Anyone who has spent hours either trying to tune or use a Wi-Fi only Real-time Location System (RTLS) network will know exactly what I am talking about. In order to address this, these RTLS networks were often enhanced by adding exciters that operated either on infrared, ultrasonic or similar short range technology. iBeacons work like an exciter in an RTLS network in that they emit a signal carrying a code, in this case a set of numbers that are unique to that particular iBeacon. These beacons operate on Low-Energy Bluetooth or BLE for short (also called Bluetooth Smart). A single beacon provides proximity, which is somewhat different than location - proximity is akin to giving someone a landmark rather than GPS coordinates when asked to give a location. A smart phone acts like the RTLS tag and provides the means to uplink to the network and send the iBeacon's information as the location. The XY coordinates of a given Beacon are supplied by the management system. Triangulation can still be accomplished by returning three iBeacon numbers. Since BLE has a small footprint by comparison to an access point, the ability to place a client on a map is greatly increased, but the need for iBeacons will be substantially greater. This provides some interesting capabilities for as there is no longer have the need for a location ready wireless network to provide proximity or location for some use cases. Like the classic Bluetooth, BLE uses the same 2.4GHz ISM band that Wi-Fi operates. However, it divides the band into forty 2MHz wide channels, each spaced 1MHz apart. These channels are divided into two types - advertising (3 available channels) and data (37 channels). BLE throughput is fairly low, with a top speed of approximately 1Mbps. The beacons attempt to avoid 2.4GHz Wi-Fi channels, by operating in the "gaps" at the edges between Channels 1/6 and 6/11, as well as above channel 11. The three advertising channels (Ch. 37-39) are located below channel 1, between 1 and 6 and at the end of the range. These locations are ideal as they have the minimum amount of interference. The above diagram depicts the 2.4GHz spectrum with both Wi-Fi and Bluetooth Low-Energy channels. The dark blue channels are the advertising channels, while the light blue are the data bearing channels. Beacons come in all shapes and sizes to fit the application for which they are being used. All beacons are fairly inexpensive ranging from $10-50 dollars depending on size and battery life. The Aruba iBeacons offer remote management features when integrated with an Aruba wireless network. For anyone deploying a large number of iBeacons this is a very welcome addition to the iBeacon offering. Given the ROI on some iBeacon deployments, it is no surprise that some companies are investigating deploying an Aruba network to leverage the management capabilities. These beacons serve as a key cornerstone of the Aruba Mobile Engagement solution. Qualcomm developed the Gimbal beacon which meets the iBeacon standards, but has added a layer of security unrivaled by any other manufacturer currently. Gimbal beacons rapidly rotate their keys making them quite secure, but may also operate as an iBeacon. Radius Networks made waves announcing a partnership with Aerohive to combine Wi-Fi and Beacon technologies for the first available solution. The Radius beacon hardware isn't differentiated from many of the other solutions out there, however the forward looking partnership is noteworthy. From left to right: Aruba Networks iBeacons, Gimbal Beacons, Radius Networks beacons. The UUID is long and easy to make unique. Standardizing the departments allows for consistency from store to store, while the major number could differentiate store locations. The UUID, Major and Minor numbers are tied together at the application level to provide meaning. Typically the Beacons do not communicate with each other, however this is beginning to change. Apple implemented Application Program Interfaces (APIs) to approximate the distance from a device to a specific iBeacon. These distances can be placed in one of three ranging categories - immediate, Near, or Far. A fourth category of Unknown exists, but it is outside of the scope of this post. Immediate proximity indicates that the phone is very near the beacon, typically a sub 1-meter distance. Near implies clear line of sight to the beacon at a distance between 1-3 meters, it is important to note that an obstructed pathway to an iBeacon may result in a Far reading. Far means that the phone is in range of beacon but at such a distance that it is difficult to approximate the location. This may a distance of up to 20m by some beacon specifications, however typically is an obstructed pathway. iBeacon accuracy is a function of signal strength and is displayed as a confidence factor. In a scenario where a "Far" value is received from the ranging function, the Accuracy indicator is often what should be used. As a phone moves closer to the beacon, the signal strength increases. With the increased signal strength, the location confidence is also increased, reducing the size of the location indicator on the phone. This illustration and description of range and accuracy can be found in the Apple "Getting Started with iBeacon" guide for developers and does a great job of illustrating the point. Beacon placements depend on the type of beacons and the applications for which they are being deployed. Battery life is one of the most critical concerns here as consideration of serviceability must be taken into account. I encourage everyone to use USB offerings when it makes sense as these can either piggyback off an access point, computer, USB equipped television, or even a simple AC to USB power adapter. However, this will not always be possible due to placement requirements dictated by the application use case. 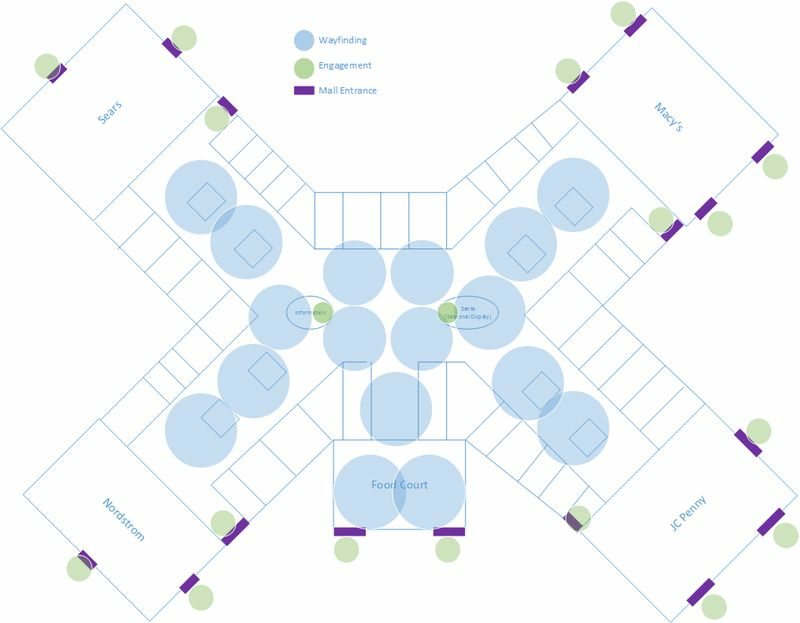 This fictitious mall map shows possible ways to place beacons to engage with mall customers. Generally, beacons will be near the entrances to wake up installed applications and beacons will be scattered throughout the mall. Mall owners typically are unable to place their own beacons within stores, but also could place them above store entrances to better determine traffic within individual storefronts. One of the solutions being touted is the ability to provide wayfinding services to customers, employees, etc. Wayfinding combines a Smartphone App with Beacons to provide the "blue dot" experience. Rather than giving a user a direction from "Location A to Location B" wayfinding solutions can use Beacons to provide a map from "Current Location to Location A" which simplifies the process. In order to make this successful, beacon density needs to be such that the current location can be determined wherever that customer is located. Given the relatively small footprint of beacon coverage, one per every thousand square feet is a good rough estimate. Like Wi-Fi, this will vary with wall construction and other obstructions. Exact placements in this situation can be somewhat flexible as generally a rough starting point is sufficient. If exact starting location is necessary then care must be taken to avoid scenarios where beacon signals bleed through walls, etc. Wayfinding capabilities vary greatly as indoor navigation logic or vector programing is difficult. Aruba Network's acquisition of Meridian Apps illustrated how valuable these capabilities are to wayfinding solution sets. Cisco's development partner Front Porch also has an innovative approach to interfacing with the customer and offers wayfinding capabilities. There are many additional solutions out there that use beacons in this way to provide wayfinding services. Placement in these scenarios is such that the beacons are close to a specific location, item, etc. This deployment is common, especially in conjunction with the others. Examples may include suites in a football stadium, ticket box office or slot machines inside a casino, or the front lobby of a hotel. The goal of these locations is to either engage with a user of the system directly or to better understand how a specific area is used. Retail has a unique challenge in that many placements are intended to cover a very small footprint, often in close proximity of others. These locations are often on shelving units and will almost always be battery powered. Fortunately they are typically easily accessible, but will need to be maintained over time. Starbucks, McDonald's, and Macy's ahve all recently been in the news touting beacon deployments. As this technology progresses and the ability to interact and truly engage with end users increases the possibilities are endless. Many features require development, however a number of good software development kits (SDKs) are being published to make this less painful. Beacons are one interesting way to location enable a three dimensional space to better understand how people use it and interact with their environments. I am currently engaged in piloting some beacon deployments for my customers and can say that it is an eye opening experience into the inner workings of some of these businesses. Vertical industry experts have a tremendous opportunity here working with technology companies to extract the maximum amount of value out of these solutions.